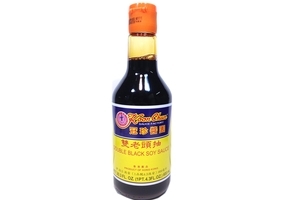 Koon Chun Double Black Soy Sauce in 20.3fl oz (600ml) bottle. Black soy sauce a dark almost black syrupy sauce. The sweet sauce used in stews or to flavor vegetables, beef or chicken. Product of Hong Kong. Halal Certified حلال .